December 9: Scientology volunteers across France are promoting human rights education, in support of the United Nations International Year of Human Rights Learning that began on December 10, 2008. The day is also marked as Human Rights Day, in honor of the United Nation’s adoption of the Universal Declaration of Human Rights (UDHR) in 1948, a document drafted by a UN Committee chaired by Eleanor Roosevelt to protect human rights and fundamental freedoms. In France, volunteers of Scientology Churches are gearing up for Human Rights Day 2009 after a year of weekly human rights education events in Paris, Lyons, Marseilles, Vannes, Clermont-Ferrand, and Nice. November 21: Scientology Churches and their members, from Australia to Zimbabwe and Canada to the Ukraine celebrate the rights of children by demanding action by private citizens and governments on International Children’s Day. Twenty years ago the United Nations General Assembly adopted the Convention on the Rights of the Child, yet millions of children still die each year from preventable causes. November 19: Scientology volunteers in Amsterdam demand full implementation of the United Nations Universal Declaration of Human Rights. Netherlands must live up to its reputation as human rights champion. Amsterdam—Scientology volunteers, determined to end blatant disregard for human rights, circulated a petition on the International Day for Tolerance November 16 to demand education on the Universal Declaration of Human Rights (UDHR) in all Netherlands schools. In fact, Scientologists from Australia to Zimbabwe and Canada to Taiwan work in their communities to educate people on human rights and their responsibility for implementing them, not only for themselves, but for others as well. November 17: Australia is the destination country for victims trafficked from East Asia, Southeast Asia, and Eastern Europe, says U.S. State Department. Scientology Volunteers in Sydney circulated a petition at Sydney Town Hall November 16, calling for mandatory human rights education in Australia to eliminate human rights abuses. One of the worst abuses is the criminal practice of human trafficking in the country. As many as 27 million are enslaved in the world today according to the United Nations, earning perpetrators upwards of $34 billion Australian annually. November 14: Scientology Churches in cities around the world observe the United Nations-designated International Day for Tolerance Monday, November 16 with petition drives calling on their countries to mandate human rights education. November 4: St. Mark United Methodist Church in South Los Angeles and the Church of Scientology of Inglewood co-sponsored the Second Annual Hate Crimes Conference on October 27 and a workshop on November 3 to educate leaders of faith-based and community-based groups on underlying causes of anti-religious hate crime. October 28: Tampa, Florida—Sponsored by the Church of Scientology of Tampa, Youth for Human Rights of Tampa Bay helped guarantee a vital human right to an entire camp of refugees in Bukavu in the Democratic Republic of Congo—the Right to Life. They did this by raising enough money to provide bed nets for some 200 refugees. 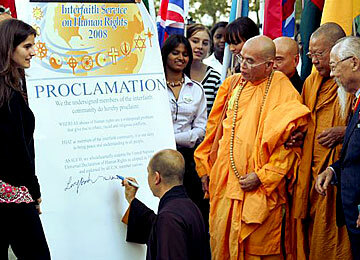 April 5: In a unanimous landmark decision today, the European Court of Human Rights (First Section) found in favor of the Scientology religion, upholding the religious freedom of Scientologists throughout the forty-six nations that comprise the Council of Europe, in a precedent-setting ruling that will help guarantee these rights for people of all faiths. The court overturned the Moscow City government's refusal to register the Church of Scientology of Moscow as a religious organization. April 3: Standford University has announced this year's Miriam Aaron Roland Volunteer Service Prize recipients, to professors Terry L. Karl and James M. Patell. The Roland Prize, established in 2004, honors Stanford faculty who in integrating academic scholarship with significant volunteer service to society, and recognizes faculty doing exemplary work at the community level, in nonprofits and NGOs, government service or philanthropy. Help make human rights a fact. 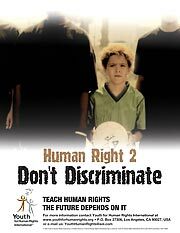 Sign a petition demanding the implementation of human rights education. © 2009 Church of Scientology International Human Rights Department. All rights reserved. For trademark information.